Designed for sea loving girls-on-the-go, the Wristlet holds all your small essentials when going from boat to land or for a casual night out. Spacious enough to fit your wallet, cell phone, keys, Chapstick, even a small bottle of water, yet swings lightly on your wrist. D ring detail with detachable wrist clutch allows you to fasten it to the key clip where it will stay safely in your beach bag! 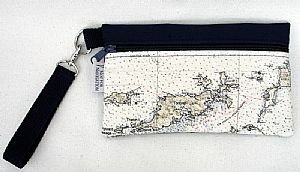 The Wristlet is also lined with nylon making it water resistant and boat friendly. British Virgin Islands imprint from a navigation chart.